This contest was in honor of postumous Navy Cross recipient, Michael Ouellette, USMC. 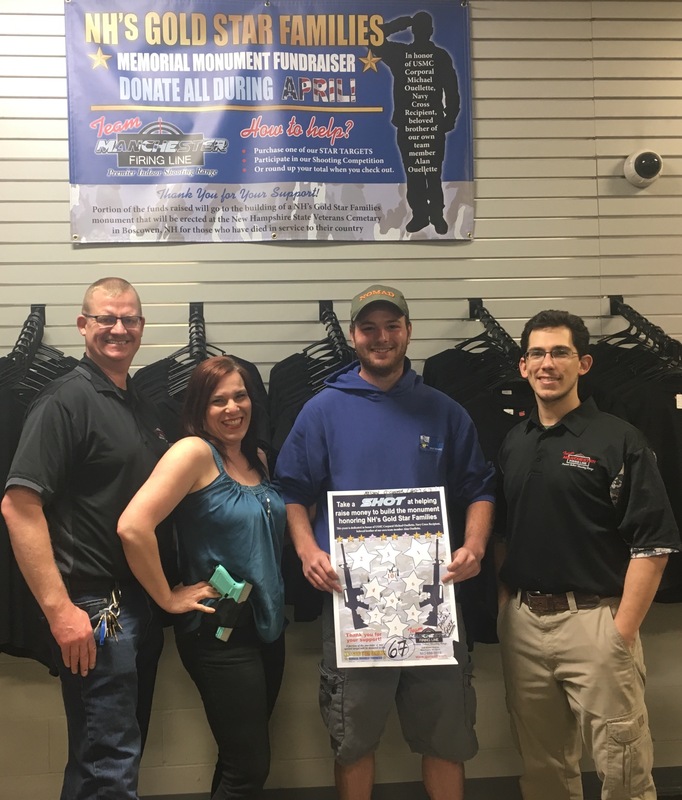 His Gold Star brother Alan Ouellette is part of our MFL family and when we heard of his family's Fundraising efforts, we just had to get involved! All throughout the month of April we ran a shooting competition to support the NH Gold Star Family Memorial Monument. Proceeds from this event went in support of this excellent cause. During April people came in and tried their hand at shooting one of our Glock 19’s at the Star Target we specially designed for this event at a distance of 60 feet. Entrants were allowed to enter as many times as they liked to try for the highest score. Our Range Officers kept track, and at the end of the month we had found our 3 winners. In third place was Mike Traynor! Winning himself a year membership at our range. In second place was Graham Grassett! For his score he took home a Crimson Trace Laser. And finally, after a whole month of entrants, many of whom tried several times, our first place winner is Nelson O’Connor! For his outstanding score of 67, he took home a Glock 19! We here at Manchester Firing Line want to extend our thanks to everyone who helped us throughout the month donate to this cause. It is very near and dear to our hearts. Thanks to all of you we were able to help this Gold Star Family Memorial Monument get that much closer to completion. Finally, the families will get a monument dedicated to them in honor of their sacrifices and support of our Military Servicemen and Servicewomen. THANK YOU FOR ALL FOR YOUR SUPPORT!